This chapter provides information about the optional Check for Updates feature in the Jedox Suite. With the information gathered from the Jedox Check for Updates, we can more easily deliver and support products for the platforms in use by our customers and the open-source community. Important: You can enable or disable the Jedox Check for Updates feature at any time (instructions below). The receiving application can derive country information from the sending HTTP request. IP addresses are NOT stored, to protect privacy and encourage participation in the program. You will be encouraged to opt into the Jedox Check for Updates program during installation. If you opt out of Check for Updates during installation, the setup will make a one-time call without sending any information about the current installation, for aggregate statistics only. If you opt-in and an update has been detected, you will be provided with the option to download the update (download page will be opened in a web browser). If later you want to enable/disable the feature, see “Disabling and Enabling”, below. 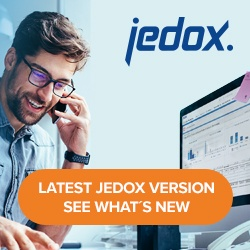 Frequency: in Jedox Excel Add-in, upon initiating a connection to the OLAP server, when the last check is more than 7 days earlier; in Jedox Web, upon every login. If you opt into the Jedox Check for Update program during installation, you will automatically opt into submitting crash dumps of the Jedox Spreadsheet Core Daemon. This option is available on Windows and Linux when Jedox Web is installed. If you opt into the Jedox Check for Update program during installation, you will automatically opt into submitting crash dumps of the Jedox MOLAP Daemon. This option is available both on Windows and Linux. A dump file is a snapshot of an app at the point in time the dump is taken. It shows what process was executed and what modules were loaded. In case of a crash of the OLAP server, additionally, the files requests.txt and palo.ini from the data directory of OLAP server are transferred. palo.ini is the configuration file of the OLAP server. The file requests.txt contains the last ten HTTP API requests successfully processed by the OLAP server, as well as any requests that were processed at the time the crash occurred. The Session IDs of the HTTP API requests are truncated in the file. When you activate this option, the IP address is also transmitted and stored. ## additional description of the dump to be uploaded dump-upload-desc "additional description"
To deactivate sending crash dumps, rename the file crash_dump.props available in <install_directory>/core. For example, you can rename it to crash_dump.props.inactive.